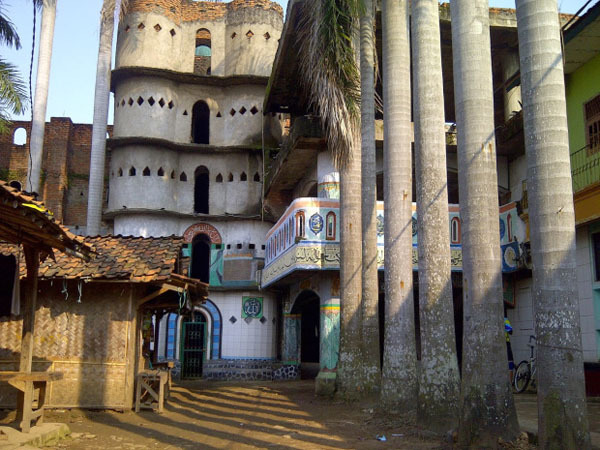 There is a unique and creepy mosque in Banten Province. It is called “Masjid Seribu Pintu”. The tourists call it a mosque of a thousand doors. The location is in Bayur Village. Today, it becomes an interesting tourist destination. Thanks to its mystical aura. Somehow, it gives a chilling atmosphere for those who visit and explore the building. As the name suggests, the mosque features tons of windows and doors. There are also different rooms, as well. The thing is the location is quite secluded. It is a little bit difficult to reach the mosque without the locals’ direction. What about the nuance? The mosque is both dark and creepy. It is quite old, after all. Not to mention the condition isn’t quite good. There are several palm trees located near to building. At least, they give a comfortable atmosphere there. For a better exploration, it is better to carry a flashlight. There are different types of rooms, as well. Make sure you explore them carefully. Otherwise, you will get lost easily. Due to this issue, it is better to hire a tour guide beforehand. The real name is Nurul Yaqin Mosque. According to the history, the mosque was built in 1978. The mosque consists of three levels. The first floor was used for dhikr and the second floor was used for praying and Salat. What about the third floor? It had the same function as the second floor. Today, the mosque becomes a religious tourist spot. Many visitors come to the mosque, especially in the Islamic holidays. That means you may expect many visitors in Ramadhan. Most of the visitors are the locals. However, there are other visitors coming from Kerawang, Bandung, Jakarta, and other cities. In fact, some of them come from Aceh. If you know nothing about the mosque, there are some keepers inside. They are friendly and helpful, so you can ask for help easily. There is a local belief. It is said you aren’t allowed to use a flashlight when entering the mosque. The locals believe it as the representation of the darkness of the grave. This way, visitors always remind how scary and lonely the afterlife is. In some parts of the mosque, you may find the number 999. According to the keepers, the number represents the amount of the name of the God. It also represents “Wali Songo”. Once you enter the mosque, you may encounter lots of dark alleyways. Each of the room consists of a mushola and it has a distinct name. Another important part is the underground. It is the home of a giant rosary, actually. It features 99 giant beds and each of them represents the name of Allah. It doesn’t take much time to visit the mosque. From Jakarta, it only takes about 1-2 hour. The distance is 40 km, so it will be a short trip. The best route to use is Pantura Street. Next, you need to follow Merak-Jakarta Freeway.